Are you tired of hauling all the materials you need to different areas of your property by using your truck or a wheelbarrow? The fact is, your truck is too big to fit into some places comfortably and a wheelbarrow is meant to torture you and cause you to do more work than you should have to. 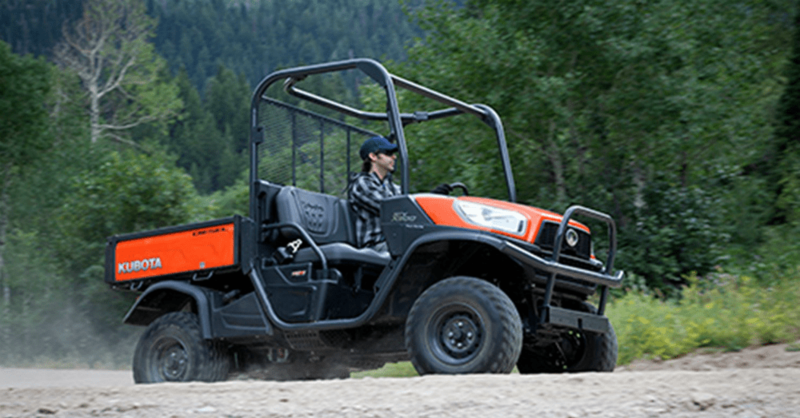 The right item to help you get the hauling done you need to be the Kubota RTV-X900. This vehicle is right for the job and it gives you the ability to haul a load of materials to wherever you need to. The new RTV-X900 is able to get a lot done for you. This Kubota vehicle is able to tow up to 1,300 pounds behind it while using a rear two-inch receiver for the ability to get the job done. There’s also room for up to 15.2 cubic feet of cargo to be hauled using the heavy-duty steel cargo box that can carry up to 1,102 pounds of tools, gear, firewood, mulch, or dirt to wherever you need to go. There are tie-down hooks in all four corners and a hydraulic engine driven cargo box that can dump the load wherever you need it to be placed. The power you need is present in this Kubota vehicle with the three-cylinder liquid-cooled diesel engine that’s extremely dependable and offers you the performance you need when you head out to get work done. This engine gives you up to 21.6 horsepower for the drive and has the ability to handle the terrain of your property and never worry that you don’t have enough power to go where you need to and handle the work that’s waiting for you. Just because you have a lot of work to do on your property doesn’t mean you shouldn’t be comfortable as you move around in this vehicle. There’s an ergonomically designed 60/40 split-bench seat that allows you to have the place to sit that you need to. The steering wheel tilts to make it comfortable for you and give you the right place for the drive. There’s storage under the seats and a large glove box to allow you to have a great place to carry the items you need to take with you. Do you want to make the Kubota RTV-X900 the right vehicle form Kubota to help you get the jobs done around your property? Of course you do, visit Jeff Schmitt Lawn & Motorsports today and take this vehicle out for a test drive to see if it’s the right one for you to get more work done around your home.